Calder 76 v Spring Hall Celtic. Ricky Topham. 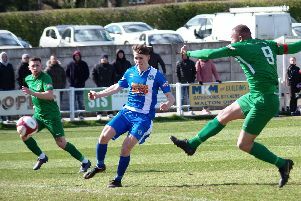 Stump Cross moved three points nearer to Ryburn United in the pair’s Halifax AFL title head-to-head with a 3-0 win at Greetland on Saturday. Two goals from Damian Watkins and one from Martin Bates did the trick for Stump, who were quickly back in action having crushed Sowerby United 6-0 three days earlier. Greetland were completing their fixtures and are in seventh place but Shelf United and Warley Rangers will expect to overtake them. Calder ‘76 have rocketed up to fourth place after extending their fine run with a 2-1 success at home to Midgley United on Saturday. Midgley slipped to third as a result but have six points more than their Calder Valley rivals from one extra game. Chances were at a premium on a hard, bobbly pitch at Luddenden Foot. Midgley, who won the first meeting with a single goal at the start of the season, drew first blood with Rob Stansfield’s free header from an Andrew Butterworth free kick after 15 minutes. However, a mix-up at the back let in Ricky Topham and he finished smartly to make it 1-1 after 35 minutes. A second mistake cost Midgley the match, Topham cashing in again after 70 minutes. Calder defended well after that, although George Bamford did hit a post in the last five minutes. Shelf moved above Warley Rangers with a 4-2 win at Elland United, who look likely to finish bottom. Oliver Coates scored twice and Elliott Parkinson and Billy Grogan were also on target in a comfortable success. Holmfield beat Midgley United Reserves for the second time in eight days to edge nearer the Division One crown. They following up a 3-1 away success with a 3-0 home victory. Second half goals from Chris Woodhouse (two) and Jason Pettifor did the trick against a Midgley side who were well served by frontrunner Jake Shaw and were far from disgraced. Holmfield are now assured promotion, after finishing bottom of the Premier almost 12 months ago, and Mixenden are poised to join them after a 7-0 win away to Volunteer Arms. Damien Randall was Mixenden’s star performer with four goals, two assists and the man of the match award. He and Travis Allison struck as Mixenden took a 2-0 lead against the wind in the first half at Savile Park. Randall bagged three more after the break and Mark Machon and a Richard Stock header completed the visitors’ tally. Sowerby Bridge head the pursuers of the leading pair. Jordan Bedford getting two of their goals in a 4-0 win away to third-from-bottom Halifax Irish Centre. Bridge went above AFC Crossleys, who had a hat-trick from Craig Gladwin away to Salem but were made to settle for a 5-5 draw. Denholme United made it six wins from their last seven games with a 4-0 home success over relegation-threatened Stainland. Christian Silkstone, one of the league’s top strikers, made a rare appearance for Ryburn Reserves and scored twice in a 3-2 home win over Elland Allstars. St Columbas derailed Brighouse Sports’ Division Two title bid with the result of the day in Division Two, a 2-1 home success. High winds at Savile Park made it difficult for either side to play the kind of passing football but Saints took a 1-0 lead into half time after winger George Cook had cut back onto his left foot and curled the ball around the defender and into the bottom corner of the net. St Columbas were playing their third game in seven days but showed great energy and desire to repel Brighouse, who now had the strong wind at their backs. Teenage ‘keeper Macauley Richardson followed his man of the match performance in the 2-2 draw against Sowerby Bridge Reserves three days earlier with a string of excellent saves before being eventually beaten by Borhan Doski. However, Saints were undeterred and 17 year old centre back Jamie Battye capped a man of the match performance with the winner, powering home a bullet header. Brighouse pushed for an equaliser right until the end but Saints deservedly picked up their biggest scalp since forming at the start of last season. The result was great news for Illingworth St Mary’s, now four points behind Brighouse with three games in hand. Illingworth crushed Sowerby Bridge Reserves 13-0 and the results eased the pressure on Saints ahead of Saturday’s game against Brighouse. Joe and Jake Griffin, Illingworth’s leading scorers, bagged eight goals between them with Joe getting five. Andrew Mellard struck twice as AFC Crossleys Reserves beat visitors Shelf United Reserves 5-2. Sowerby United Reserves continued their improvement with a 3-2 win at Hebden Royd Red Star Reserves, Conor McGow scoring two goals for the winners.